Starring Robert Carlyle, Rose Byrne, Jeremy Renner, Imogen Poots, Mackintosh Muggleton, Harold Perrineau, and Idris Elba. 28 weeks after the RAGE virus devastated Britain and with the infection dying out, a US-led NATO forced invades the country to restore order and rehouse survivors. This return to stability proves short-lived however as the RAGE virus finds it’s way back into London Safe Zone and the infection begins to its bloody spread once more. 28 Days Later is easily one of the greatest zombie films ever made and one of the greatest horror films of the last decade. So, you can imagine my hesitation when it was announced that a sequel was to be made, especially considering that the original was so masterfully done and in all honesty really need a follow-up. Thankfully, in a case of expectations being exceeded and then some, 28 Weeks Later gives us a sequel that manages to mostly stay faithful to the ideas and themes of the original but is also willing to do its own thing giving us arguably one of the most underrated horror sequels of all time. While original director Danny Boyle sadly doesn’t return for the sequel (he remains as an executive producer) his shoes are more than adequately filled by Spanish director Juan Carlos Fresnadillo. Rather than copying the original film’s quiet approach that both worked as a means of building a sense of eerie tension and poignant solemnity, Fresnadillo instead opts to give a film that goes for the jugular and give us a much more aggressive approach to the material from its opening minutes. Speaking of the opening, 28 Weeks Later boasts one of my favourite horror openings, a quiet candlelit dinner that turns into the classic zombies overwhelming the farmhouse scenario. The scene is frenetic in it’s pacing, nail-biting in its tension and is the perfect scene of raw terror. 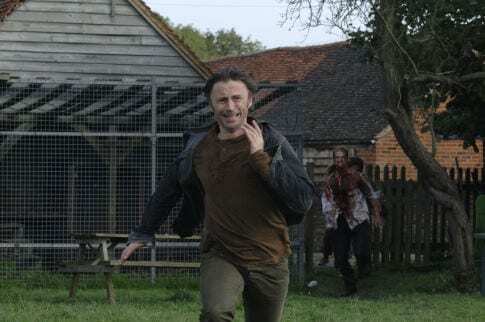 The moment in which Don (Robert Carlyle) runs for his life as a large crowd of infected bears down on him is a brilliantly frightening shot. And much like the original, the scene ends with a moment of chilling quiet that makes your spine tingle and lets you sit in a puddle of your own sweat. My fellow Scotsman Robert Carlyle is great as always in the role of Don, a man whose failure to save his wife by abandoning her to her death looms over him. Carlyle’s great skill in the role is to make this potentially loathsome character sympathetic and human. Carlyle at least tries to make you understand why Don had to abandon his wife because, at that moment, it seemed like he had no other choice. You might hate him for what he’s done, but it’s clear that he hates himself more than anyone could for what he did. You can see this pain clear as day even as he finds himself lying to his children about what happened to their mother. It’s another fine piece of work from one of Scotland’s finest actors, even if he spends most of the film’s second half in a slobbering blood spewing reprisal of his role as Begbie from Trainspotting minus the hilarious dialogue. 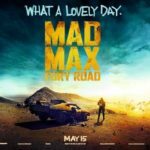 We also have a fine (and star-studded) supporting cast including Jeremy Renner as a US Army sniper who finds himself risking his life to protect Carlyle’s children while also trying to save his own skin, Rose Byrne as an Army doctor whose warnings about the RAGE virus returning seem to be falling on the deaf ears of her superiors, as it always happens, and the always welcome Idris Elba as Stone the classic “everything will be fine” US commander archetype. 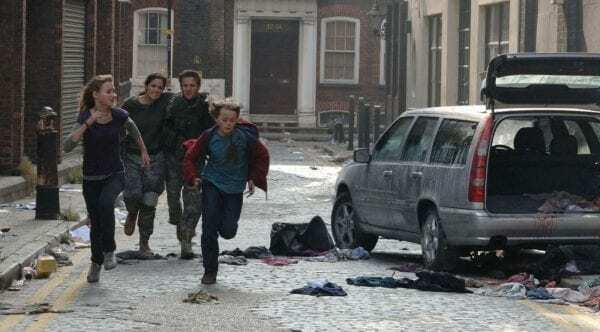 Unlike the original, 28 Weeks Later gives us a much more visceral and action-packed approach to the horror, with it being packed with action heavy set pieces such as a massacre of infected and civilians alike by US soldiers and a firebombing of London to boot. It’s all good stuff and it does differentiate itself from its more restrained predecessor, although it does leave it lacking in the same poignancy, humanity and pathos. Also, the characters are slightly less developed and often find yourself not really feeling much of a pang of sadness when they die. The film also has a one particular moment that somewhat betrays the grounded realistic approach of the original film and most of this sequel, with the blatant trip into absurdity being a horde of infected being shredded by a helicopter blade being flown into them. It’s a scene that works in an already absurd work like Planet Terror, but in an otherwise grounded and serious film like this one just feels a bit out of place. The film’s themes are somewhat more overtly political than the first film, at least in my interpretation, with the film’s story sometimes feeling like a commentary on the (at the time) recent US-led invasion of Iraq, with the somewhat overly optimistic hopes for rebuilding Britain mirroring the real-life overly optimistic hopes of rebuilding Iraq, which, like in the film, collapsed into bloody chaos. I’m all for some political commentary in my horror films, but it’s a tad more obvious and just a bit less interesting than it’s predecessor much more subtle and more complex take on humanity’s capacity for violence. Regardless though, it’s still a welcome addition that adds a little something extra to an already enjoyable film. 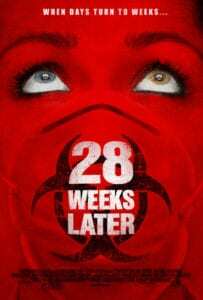 With solid acting, fast pacing and an overall more ferocious approach to the material, 28 Weeks Later, while perhaps not as masterful as the original 28 Days Later, is still a great horror sequel that I feel deserves much more love than it currently gets. Check this one out and spread the love. Now, let’s just hope that with Danny Boyle free of his James Bond duties that he might find the time to give us the long-mooted 28 Months Later. Make it happen, Boyle.